From the deep, unpolluted waters near Norway, Carlson brings you the finest cod liver oil which is naturally rich in vitamin A, Vitamin D3, EPA and DHA. Only cod fish caught during the winter and early spring are used, as the liver oil content is highest at this time of year. The oil is separated from the liver tissues without the use of chemicals. 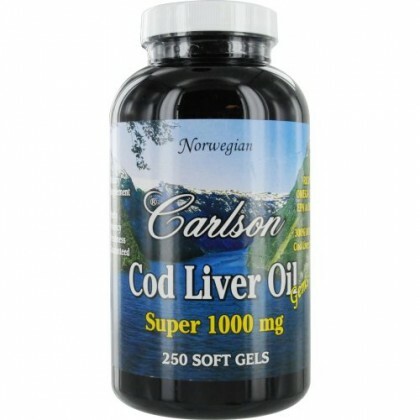 Super 1000 mg provides 300% more cod liver oil than other softgels. This product is regularly tested (using AOAC international protocols) for freshness, potency and purity by an independent, FDA-registered laboratory and has been determined to be fresh, fully potent and free of detrimental levels of mercury, cadmium, lead, PCBs and 29 other contaminants.